Offered by the Art and Art History department. Imagine. Search. See. Shape. Sharpen. Express. Invent. Experiment. Reflect. Analyze. Resolve. Share. The stages of art-making are many and uniquely challenging. The rewards? Discover a deeper sense of self and self-awareness. Create beauty. Speak truth. Build agility as an original thinker, nimble problem-solver, inventive tinkerer, disciplined doer—skill sets that have broad application in our increasingly complex world. 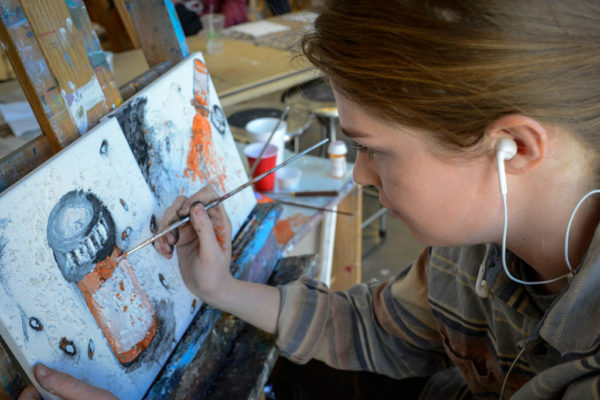 Through a wide breadth of course offerings in design, drawing, filmmaking, painting, photography, printmaking, and sculpture, in state-of-the-art facilities that give students the space, equipment, and expert training in traditional and cutting edge artistic techniques, expect to be transformed. For permission to enter the studio concentration, students must submit a portfolio of their work to the department during their sophomore year. Faculty review of portfolio submissions occurs once during the fall and once during the spring semester. All students who wish to be studio majors must be approved and accepted by the end of their sophomore year. For any questions regarding studio art, please contact the chair, Claudia R. Fieo. The studio art concentration consists of at least 12 semester courses. Three studio art courses must be taken at or above the 300-level. Two Art History courses. Must be completed before senior year. These foundation courses must be taken at Wheaton before senior year. Five additional studio art courses in diverse media. One elective course must be at the 300-level. 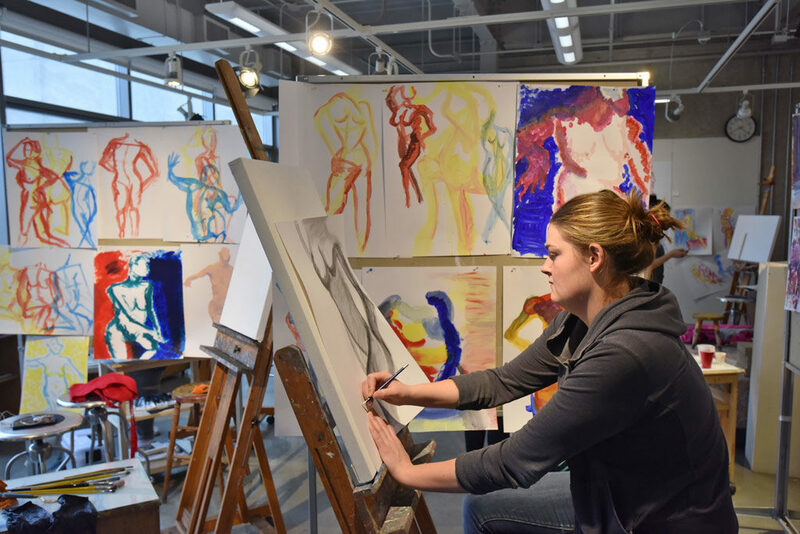 A minor in studio art consists of five studio courses, at least one of which must be at the 300 level. This means that the student must take two foundation-level courses (ARTS 116 or ARTS 111 or ARTS 112) and three additional courses, one of which is a 300-level course. Students contemplating a studio minor should take careful note of the prerequisites for 200- and 300-level courses. Art history majors may minor in studio art by taking four additional studio courses above and beyond the two required for the major (for a total of six). For any questions regarding the studio art minor, please contact the studio coordinator, Claudia R. Fieo. An opportunity to do independent work. Students must preregister with their independent advisor after submitting a written statement of intent for faculty approval. This course is an introduction to visual language and artistic practice. Students develop problem-solving skills by applying them to the fundamental concepts of design and pictorial organization. The basic elements of two–dimensional art such as line, shape, color and value are explored through the lens of design principles such as unity, harmony, balance, contrast and rhythm. 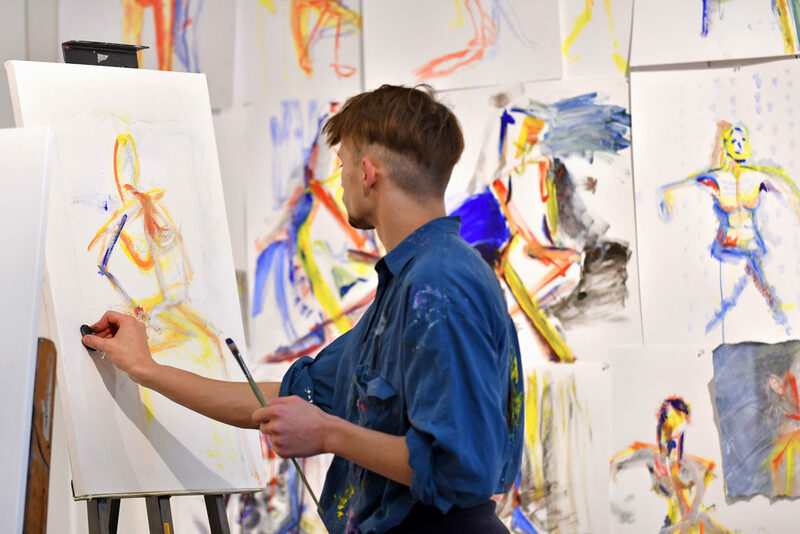 Creative expression and the integration of art elements are explored through a variety of processes including drawing, collage, painting, and basic color theory. In this class we use a direct, hands-on approach to materials and concepts. Emphasis is placed on the development of the student’s visual sensitivity, aesthetic judgment and artistic perception. Spatial dynamics is an exploration of objects in space and the space within objects. 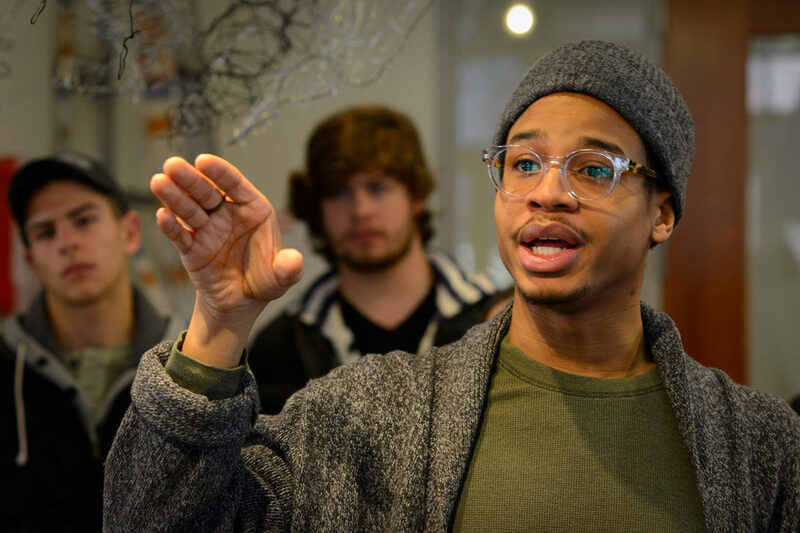 As a gateway course in the Department of Art and Art History, our approach will focus on the fundamental possibilities of form and structure as embraced by artists, designers, architects, and other careful observers of the world. Participants will respond to theoretical challenges by creating objects with quick and easy-to-manipulate materials like paper, clay, and plaster. Work will take place individually and in collaboration. Projects will be hands-on and through critical discussion, students will emerge equipped with tools to conceive of dynamic and meaningful objects. Drawing is a universal language and a powerful tool of communication, making our thoughts and feelings visible and providing an effective means to investigate the world we live in. In this beginning class, students learn to “see” by engaging in intense observation and visual analysis. We explore the fundamentals of line, shape, value, proportion and perspective through a variety of drawing tools and materials. Working primarily from direct perception, students explore objects, landscape and the human figure. Drawing I links technical proficiency with conceptual development to create a solid foundation that prepares students for further study in visual art. This intermediate course will focus on more advanced techniques in composition and concept development. Students will continue to build skills with direct perceptual drawing using objects, landscape and the figure as a motif. In addition, they will explore other approaches such as abstraction, mixed media, color work and larger scale formats. Students will experiment with a variety of materials and methods to develop more personal visual statements. An introduction to the technical, conceptual, and critical skills central to the expanding practice of contemporary sculpture. Participants will learn to manipulate wood, metal, and found objects and will develop skills in mold making and casting using a range of materials such as wax, rubber, and concrete. Projects will support individual conceptual interests while exploring issues of object-making like form and process, context and installation, aesthetics, new media, and collaboration and social practice. An introduction to relief printing: students will create linocuts and woodcuts in black and white, as well as reduction prints and multi-block prints in color. Students also will experiment with contemporary relief materials using hand drawn and digitally manipulated imagery. Technical aspects include carving techniques, figure ground reversal, color mixing, registration and edition printing for class portfolio projects. Students will explore their creative process as they develop and refine concepts and composition, including the discipline of daily sketchbook activity. This course is an introduction to oil painting, focusing on the basic problems of color mixing, form and composition. Projects include still life, the figure and color exercises. Emphasis is placed on working from perception, translating what we see into the illusion of three dimensions. Through the direct painting method, we will explore color, surface and texture while gaining control of paint manipulation. Beginning projects include achromatic studies, monochrome color and complementary sets. We will explore a full color palette and end with a self-directed final project. Prerequisite: Drawing I or 2D-Design. The fundamentals of photography including the use of the camera, composition, light and subject; developing, printing and enlarging processes studied and performed by the student. Students must have a 35mm camera or a medium-format camera that allows for total control. This course is a two track approach to image making: learning of the technical aspects of traditional black and white photographic image making, combined with the aesthetic concerns and creative problem solving issues associated with the making of high quality expressive photographs. Graphic Design I is the first of a two course, year-long exploration of design as communication. Students will learn the basic principles and practice of graphic design with an emphasis on the creative problem-solving process necessary to produce successful design solutions. The student will be challenged to reach original design solutions after arriving at an understanding of both traditional and modern approaches to typography and design layout. There is required computer graphics lab component to this class that will focus on technical know-how as students learn to navigate computer graphics programs and apply what they learn to their course projects. An intensive hands-on introduction to the art and craft of visual storytelling with film/video. The class is conceptually divided into four core areas; Image, Sound, Editing, and Storytelling. 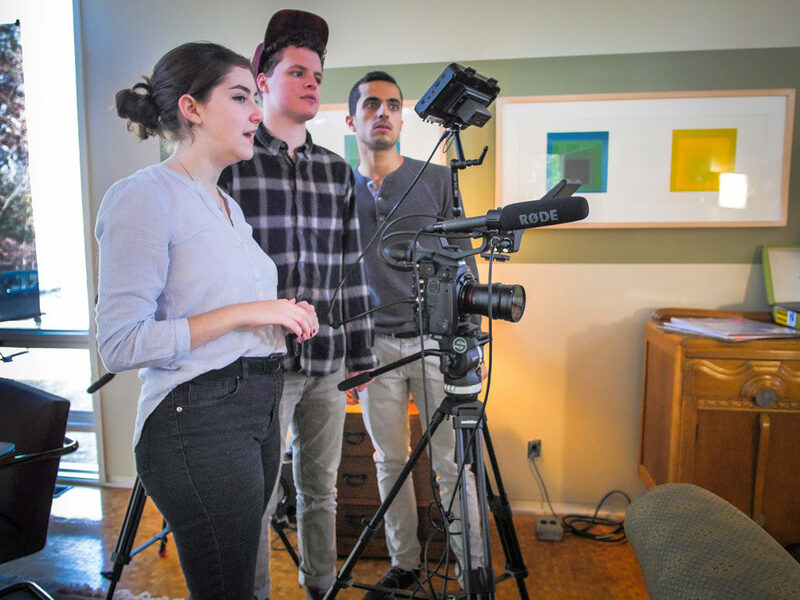 Students plan, shoot, and edit two short non-sync (no dialogue) projects while engaging in a broad exploration of the technical and artistic components of filmmaking. These projects are supported by in-class exercises, discussion, readings and some film screenings. Screenwriting examines the fundamentals of writing for visual media; idea development, screenplay format, story structure, character, dialogue, visualization, and conflict. Students will write and workshop three scripts of varying lengths over the course of the semester, read a variety of scripts and screenplays, and review/critique a variety of short films. This course will introduce students to the world of animation through a series of hands-on exercises, projects, and screenings of the most impressive independent animation from around the world. The projects cover a variety of animation concepts and techniques, all of which are based in animating real materials and digital recording methods. Basic editing and sound design are introduced, as is output to a variety of digital formats and compressions. Group discussions accompany the discovery of animation films, techniques and methods. 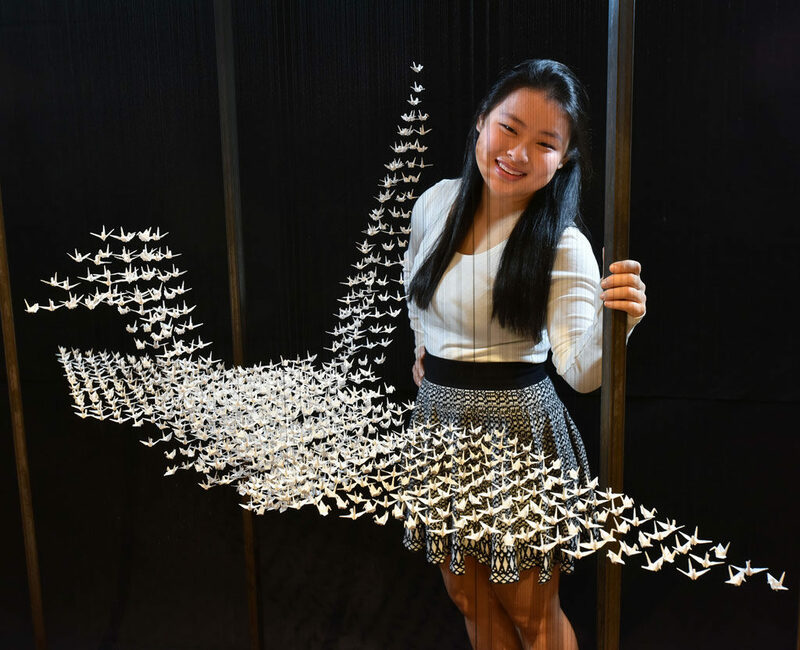 A final project of the student’s own design will be based on a Haiku. Note: This course has been taught for the past several years by several adjunct professors. A study of film and video editing from both technical and aesthetic perspectives. Students will utilize Adobe Premiere, AfterEffects, and Photoshop to engage in multiple editing projects spanning a variety of modes; Narrative, Documentary, Experimental, Remix and Video Essay. Students will examine how a story/idea is most effectively assembled and enhanced through the use of sequence structure, image juxtaposition, shot duration, pacing and rhythm and continuity. Furthermore, students will develop skills in fundamental areas of post-production, including title design, motion graphics, color correction, greenscreen compositing, audio sweetening and audio mixing. As online distribution has contributed to a golden age of short form non-fiction filmmaking, it is imperative that aspiring filmmakers and media-makers become fluent in the aesthetics and story potential of the documentary form. Documentary Storytelling is an intensive hands-on introduction to the art and craft of short form documentary production. Students will produce two documentary projects, engage in a variety of in-class filmmaking exercises and challenges, study a variety of films and texts, and critique each other’s work. This course introduces the various traditional and contemporary plate-making techniques and the printing process used to create an intaglio print. 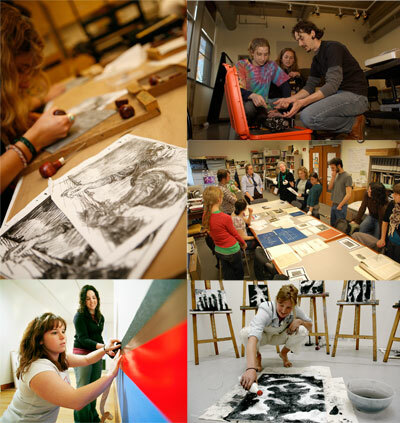 Students will explore both hand techniques such as drypoint, engraving and mezzotint; as well as etching techniques, including line etching, soft ground, aquatint, and spitbite. Collagraphs and/or Solarplates are also introduced as alternative plate-making methods. Technical aspects of printing include viscosity printing, registration, and edition printing for class portfolio projects. While learning to employ the various intaglio techniques, students explore their creative process, including the discipline of keeping a sketchbook, as they develop and refine concepts and composition in projects that emphasize personal imagery and narratives. This intermediate course in oil painting continues and expands on the direct painting method of Painting I. Further exploration of painting technique from under- painting and glazing to impasto is done through large and small- scale work following more self-directed themes. Students will investigate abstraction and work from the model concluding with a final three part series. Slide-illustrated lectures and frequent discussion of student projects support studio work and conceptual development. Prerequisite: Painting I or 2-D Design. This course is an introduction to lithography, which is a planographic printmaking medium based on one simple principle – the antipathy of oil and water. 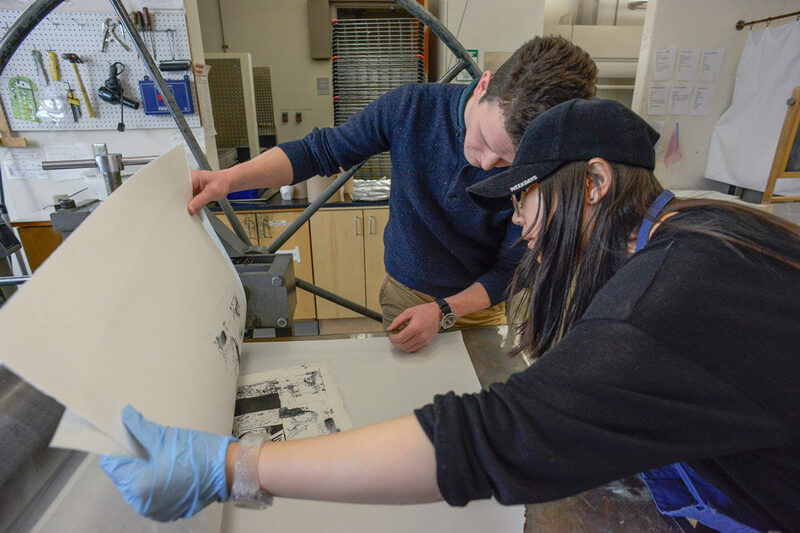 Though the course will offer an historical overview of stone and plate lithographic techniques, students will experiment with more environmentally friendly and less toxic contemporary lithographic techniques, creating prints both in black and white and color. At the conclusion of the course, students will have completed an editioned portfolio of works housed in a hand-constructed folio. Technical aspects of printing include color mixing and transparency, registration, and edition printing for class portfolio projects. Students will explore their creative process, including the discipline of keeping a sketchbook, as they develop and refine concepts and composition in projects that emphasize personal imagery and narratives. This is a digital course designed to encourage students to explore and develop their visual perception and a personal point of view. This is a rigorous course, based in Adobe Lightroom and to some degree Photoshop. Students must have a quality digital camera capable of manual control over f-stops and shutter speeds. Students must be willing to fully invest themselves in this course to investigate and express their aesthetic concerns. Graphic Design II is the second course in a year-long exploration of the basic principles and practice of graphic design, with an emphasis on the creative process, beginning with critical thinking and a strong problem-solving approach that leads to innovative design solutions. In the context of more comprehensive and real world design problems, including corporate identity systems, packaging design, editorial design and visual advocacy, students learn to expand on the principles of typography and visual imagery, design layout, and computer graphics learned in Graphic Design I. An intensive hands-on film/video production in which students will explore advanced techniques in directing, cinematography, lighting, editing, and sound design. The class will be broken up into teams of four students, who will conceive a story, translate it into visual language, and produce a 10-minute film. This project is supported with a variety of in-class critique sessions, hands-on production challenges, discussions, and film screenings. Printmaking Techniques and Approaches offers an in-depth exploration of select contemporary and traditional printmaking techniques, with a particular focus on innovative approaches and presentation options, such as: print folios and artist books for serial and sequential imagery; one-of-a kind sculptural or mix-media prints; and collaborative group projects. This course emphasizes the development of each student’s personal thematic content. Previous printmaking experience helpful but not required. This independent study course offers students the opportunity to work in a medium of their choice at an advanced level, with oversight and support of a faculty member. Students must preregister with their independent study advisor after submitting a written statement of intent for approval. 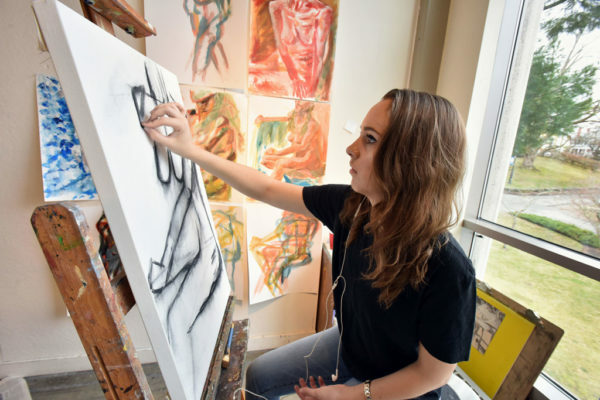 It is recommended that all studio art majors take Arts 399: Selected Topics in the fall of their senior year to prepare better for the Senior Seminar and Senior Studio Art Majors Exhibition in the spring semester. This course is the capstone experience for studio art majors. Senior students are expected to produce a defining body of work in the medium of their choice, which will be exhibited in the Beard and Weil Galleries at the end of the semester. In this semester-long course, students meet once per week for three hours to discuss a variety of topics in preparation for professional practice. Formal critique sessions provide students with feedback on the development of their work as it progresses toward the Senior Studio Art Majors Exhibition. Offered to selected students at the invitation of the department. The opportunity to pursue honors is offered to selected seniors by invitation only. At the end of the fall term of the senior year, the Studio Art faculty meets as a group and identifies promising students from the ranks of those taking ARTS 399: Selected Topics. Those students who show exemplary work are invited to pursue Honors by the department. Faculty legislation requires that honors work must be above and beyond the normal scope of the major. Two courses, Studio Art 399 – Selected Topics (ARTS 399) and ARTS 500, will ultimately make up the year-long course of study above and beyond the normal major requirements. Therefore, the student pursuing honors must register spring semester for both ARTS 500: Honors and Studio Art 402 – Senior Seminar (ARTS 402): Senior Seminar and expand on the work begun fall semester in ARTS 399 to produce a body of work at least one and three-fourth times greater than what is required for the Senior Seminar alone. Final requirements include a written thesis and oral defense. The studio art faculty as a whole determines the grade for the Arts 500 course and whether honors will be awarded.